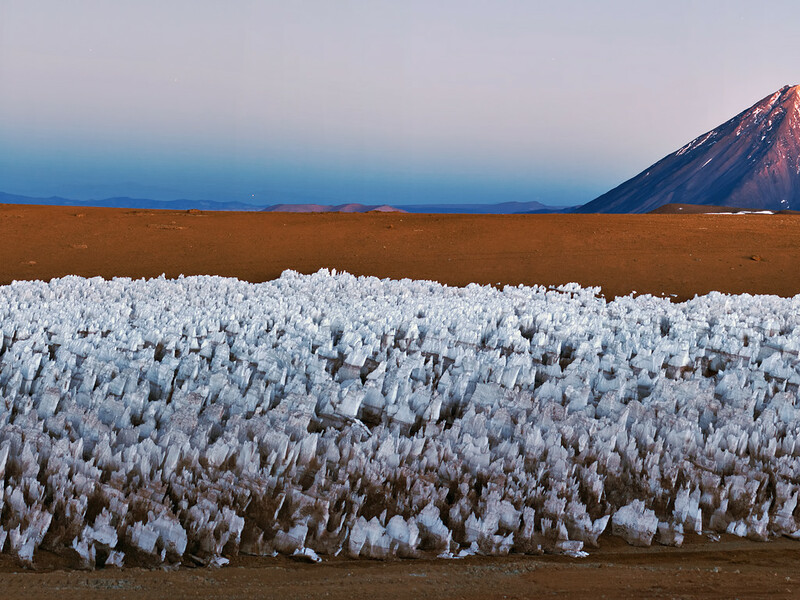 This impressive panoramic image depicts the Chajnantor Plateau — home of the Atacama Large Millimeter/submillimeter Array (ALMA) — with the majestic Licancabur volcano in the background. 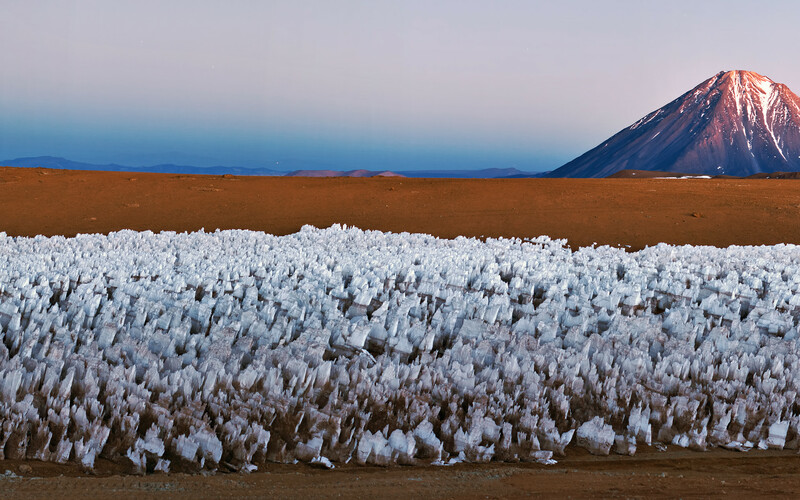 Watched over by Licancabur, a icy forest of penitentes (Spanish for “penitents”) cluster in the foreground. The penitentes are a curious natural phenomenon found in high-altitude regions. They are thin spikes of hardened snow or ice, with sharp edges pointing towards the Sun, reaching heights from a few centimetres up to several metres. You can read more about penitentes in a previous Picture of the Week (potw1221). 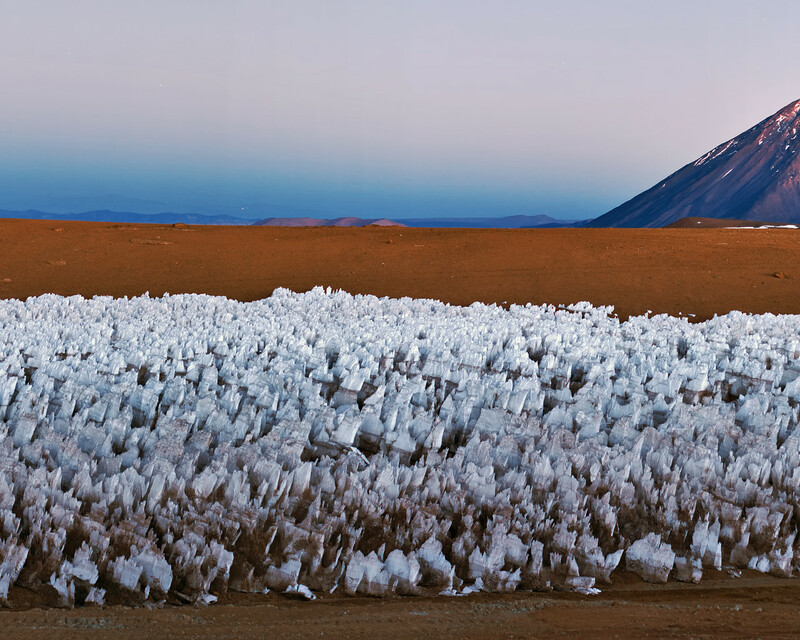 The Licancabur volcano, with an altitude of 5920 metres, is the most iconic volcano in the area of San Pedro de Atacama, Chile. Its conical shape makes it easily recognisable even from very far away. It is located on the southernmost part of the border between Chile and Bolivia. The volcano contains one of the world’s highest lakes in its summit crater. This lake has attracted the attention of biologists, who are interested on studying how microscopic organisms can survive in it, despite the very harsh environment of intense ultraviolet radiation, the thin atmosphere, and cold temperatures. The survival strategies of microscopic life in Licancabur Lake may even give us insights into the possibility of life on ancient Mars. This photograph was taken by Babak Tafreshi, one of the ESO Photo Ambassadors, near the ALMA site.